September | 2015 | Welcome to the RW Carbon Blog! With so many carbon fiber aero mods available for the F06 gran coupe, F12 convertible and F13 coupe 6 series and M6 models it can be difficult to choose which one is the best for your build. 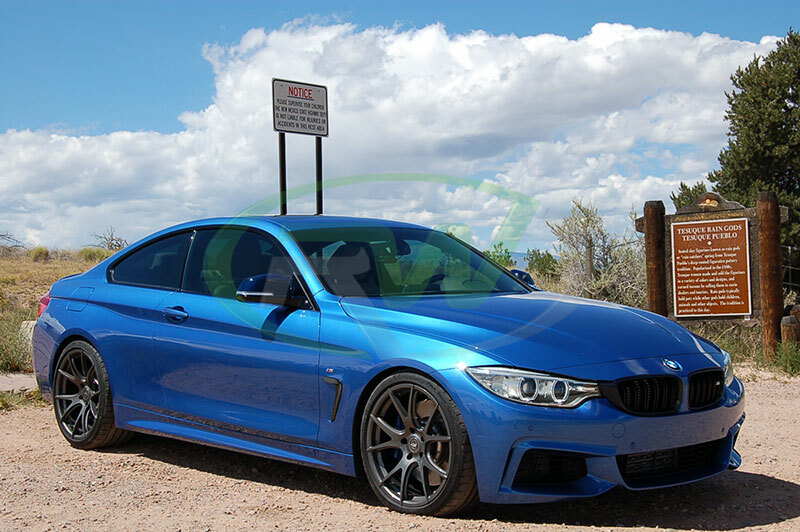 This guide will show you some of the most popular carbon fiber parts and accessories for your new 6 series or M6 and give you the benefits of each one. With this simple guide you will have your BMW looking more aggressive and unique in no time. The search for the right style carbon fiber aero product for your 6 series is only half the battle these days. There are a lot of retailers popping up with similar carbon fiber parts, but which one is the right one for you? 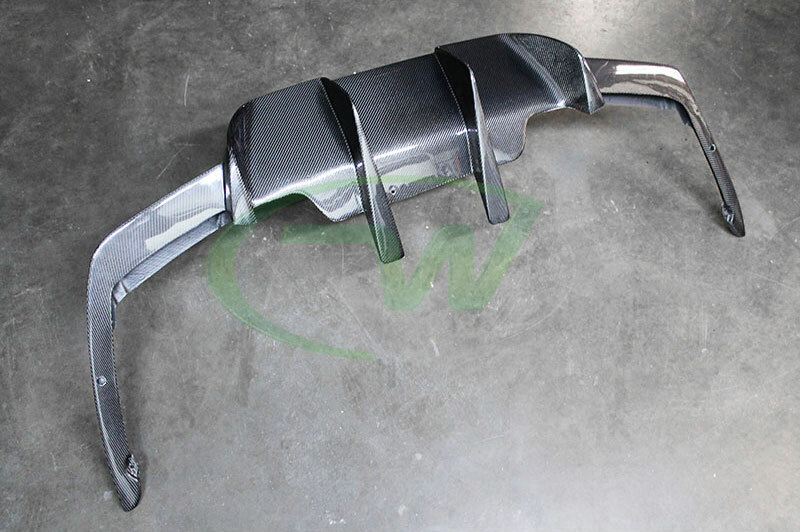 RW Carbon offers only high quality carbon fiber parts and accessories. Every product we produce is made using top of line materials such as our carbon fiber fabric, clear coats and resins. Each one is hand crafted by professionals in our factory overseas. Once each piece is constructed we spray them with several coats of high gloss clear coat. This enhances the natural beauty of the carbon fiber weave and protects it from the harsh outdoor elements it have have to endure. Being hand crafted raises the risk for small defects to occur, which is why we quality control our 6 series parts and accessories not only once but twice. They are all checked at our factory before shipping to us and once again in our Southern California Facility before shipping to our customers. This minimizes the risk that you receive a blemish product. To enhance our customers experience we also back each one of our products with a fitment and quality guarantee. If you receive a part from us and the fitment is less then satisfactory please contact us and we will replace it for you, with no money out of your pocket. 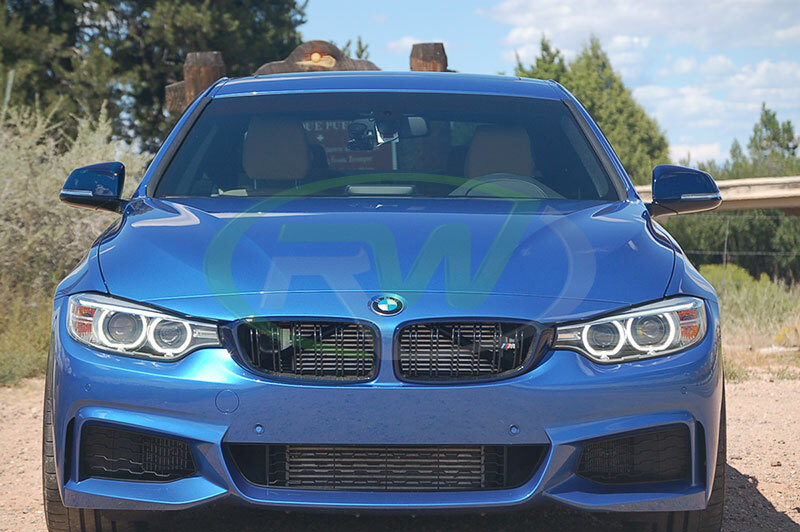 So shop with confidence at RW Carbon, and choose us as your number 1 source for carbon fiber parts for your 640i, 650i or M6. 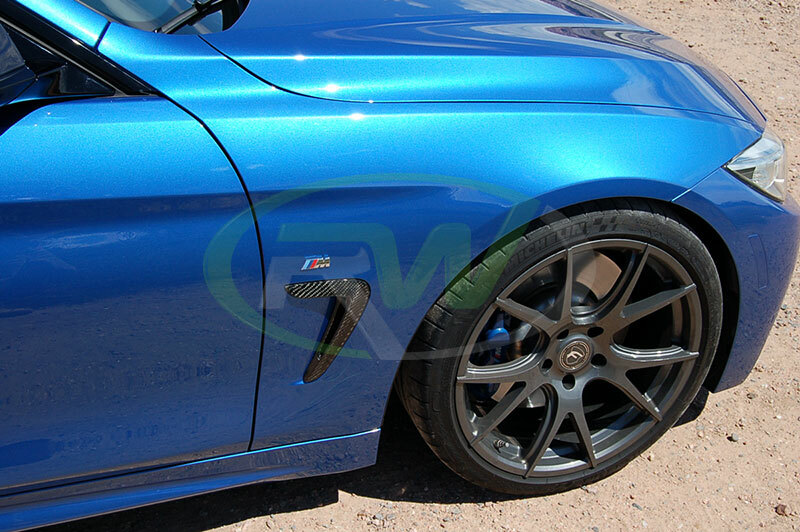 With some of the benefits of RW Carbon out of the way we can move into what style parts are best for your 6 series build. 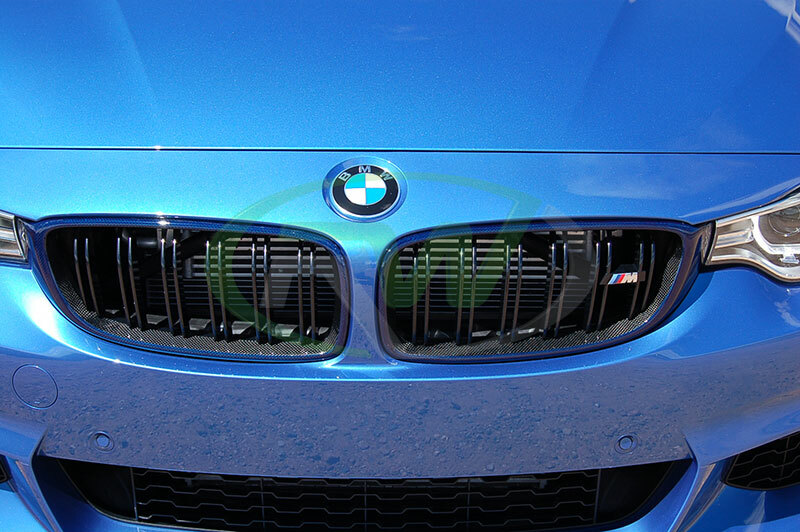 Lets start with the most important aspect of your BMW, the front end. 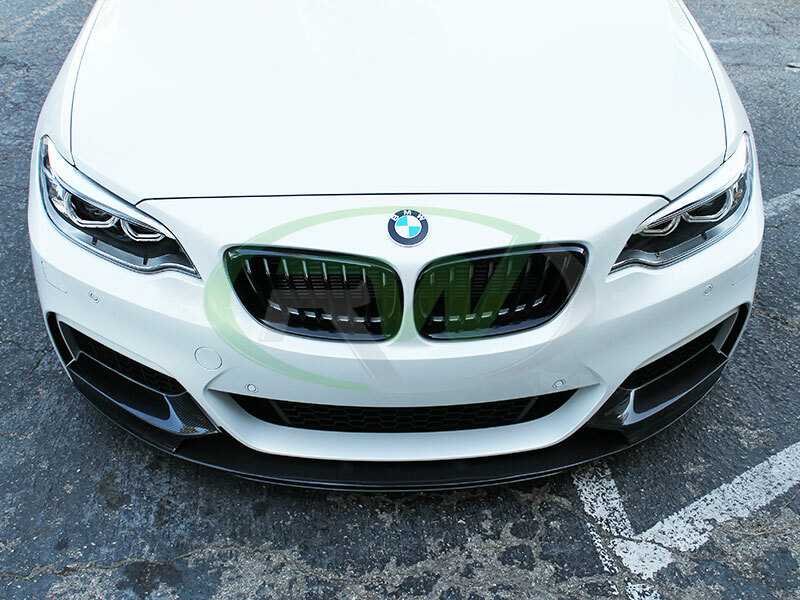 Modifying the front end of your BMW is be best way to impress the community and create more of a presence, as it is typically the first part people look at on your car. A carbon fiber front lip is the best way to do this. It adds a sleeker and lower profile to your 6 series, while making it more aggressive and aerodynamic. 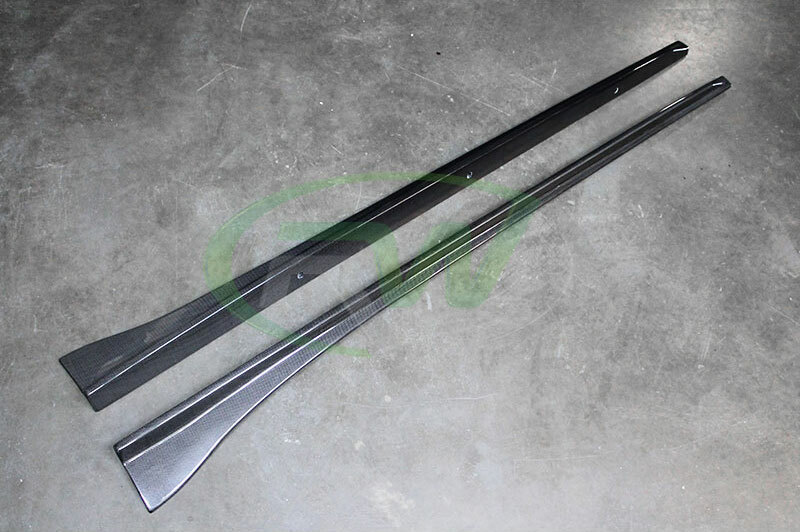 Our current line up of front lip spoilers consists of only one at this time, but is very popular with the community. It is designed to fit the F06, F12 and F13 M6 models. 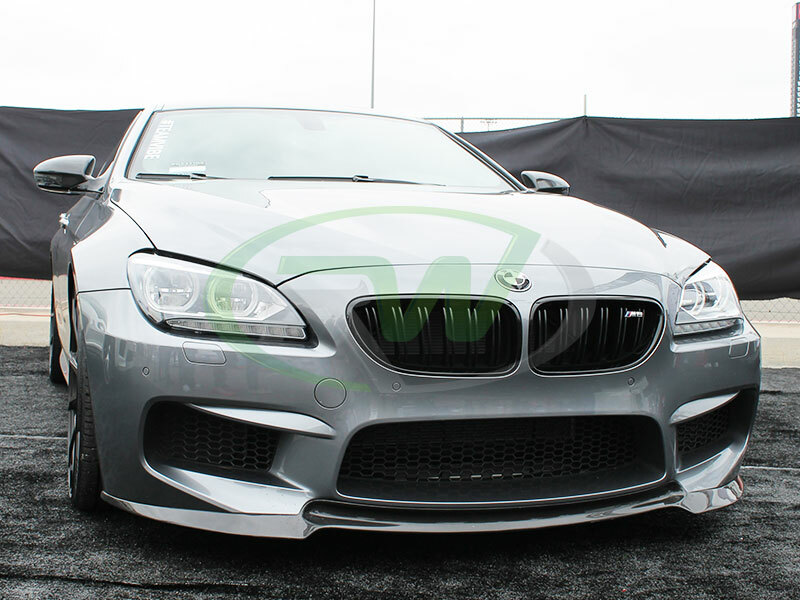 It is our DTM M6 Carbon Fiber Front Lip Spoiler. if is made using real carbon and is stocked in a 2×2 weave pattern. However, we can also custom ordered in a 1×1 pattern just like any of our parts (Inquire). These lips are installed using about 8 self taping screws. 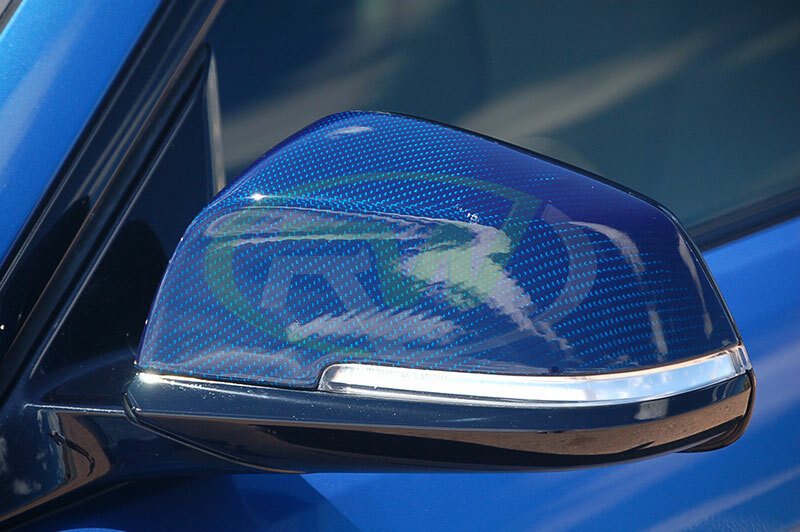 Although they are fairly simple to install we highly suggest professional installation if you have not installed carbon fiber products before. Next on the list of carbon fiber aero mods is the rear diffuser. The look of your 6 series or M6 has to be on point when you are pulling away from your competitors. A diffuser is a must to complete the overall theme of carbon fiber and adds that mush need aggressive and low stance in the rear. 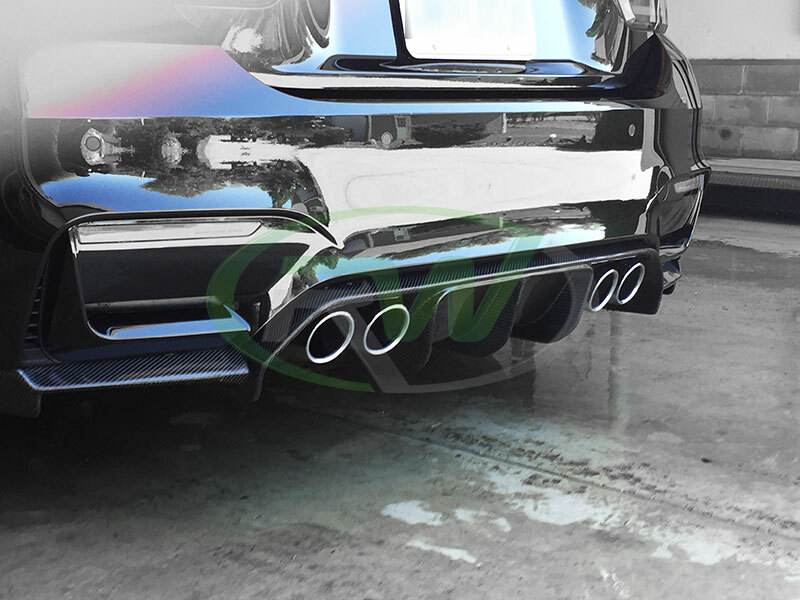 A diffuser will also compliment an aftermarket exhaust system or tips. RW Carbon currently offers 2 styles for diffusers, but come in several combinations. Both options will fit the M6 and 6 series models (640i & 650i) with the M Sport package. First we have the Performance style 2 piece CF diffuser. This one comes with an outer piece and a center section. If you have a Non M6 model you will have to buy both pieces to run this diffuser. 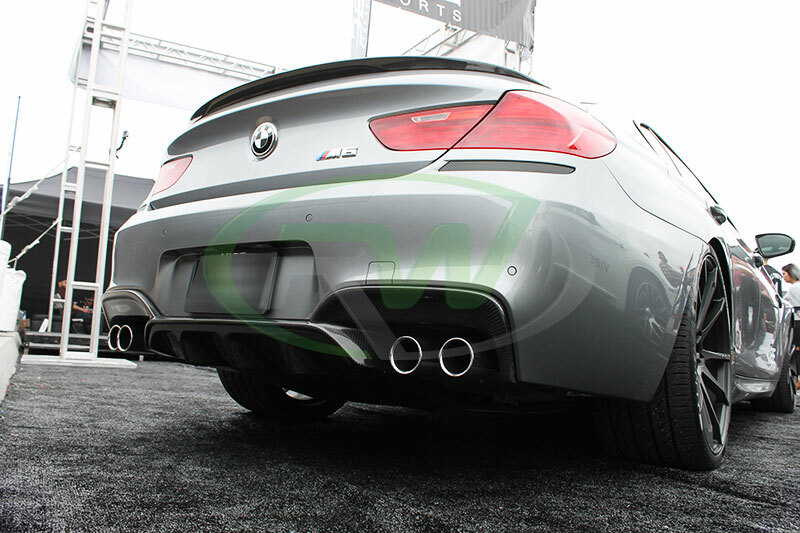 The rear bumpers of all M Sport or M6 F06, F12 and F13 BMW’s have the same rear bumpers. The only difference being the diffuser section. Installation requires the removal of the rear bumper. The Second choice for the diffusers is our new DTM carbon fiber diffuser. This is a one piece design and fits the M6 and 6 series models (640i & 650i) with the M Sport package as well. 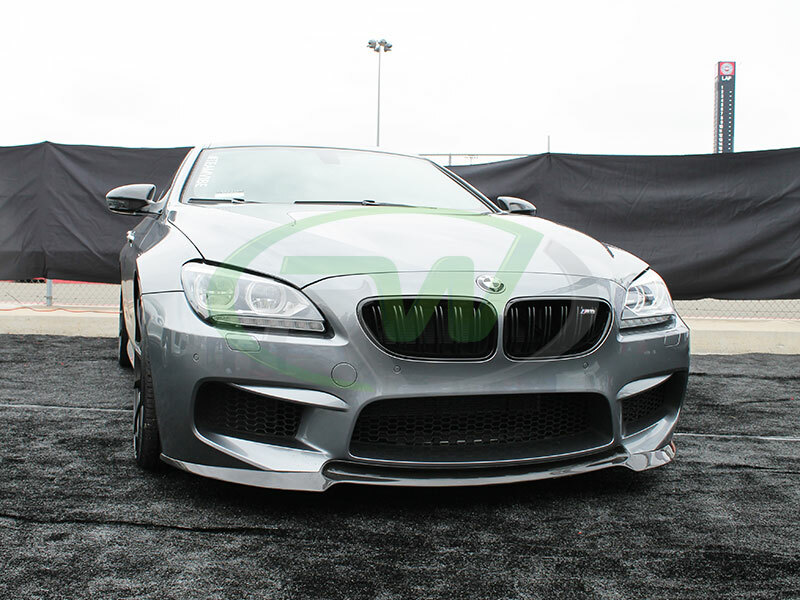 However if you have a Non M6 model you will have to purchase OEM part number 51128052677. This is the outer diffuser portion that this diffuser needs to be matched with. The DTM diffuser and outer Performance style section can be used together for the ultimate CF look, however some modification will be required. 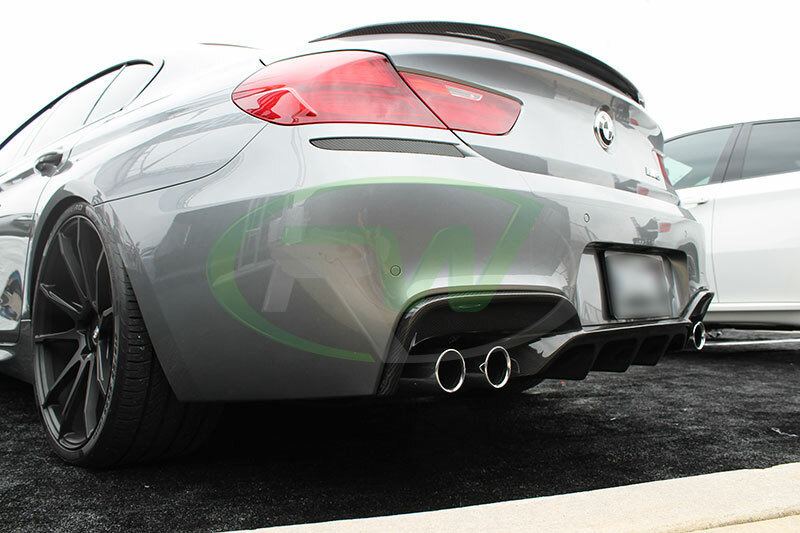 The installation for this diffuser does not require the removal of the rear bumper on an M6 but is still recommended for optimal fitment. If you need the outer section (6 series owners) then removal of the rear bumper is required. Both diffuser re-use OEM mounting hardware and utilize tabs and clips in the OE mounting locations for easier installation. 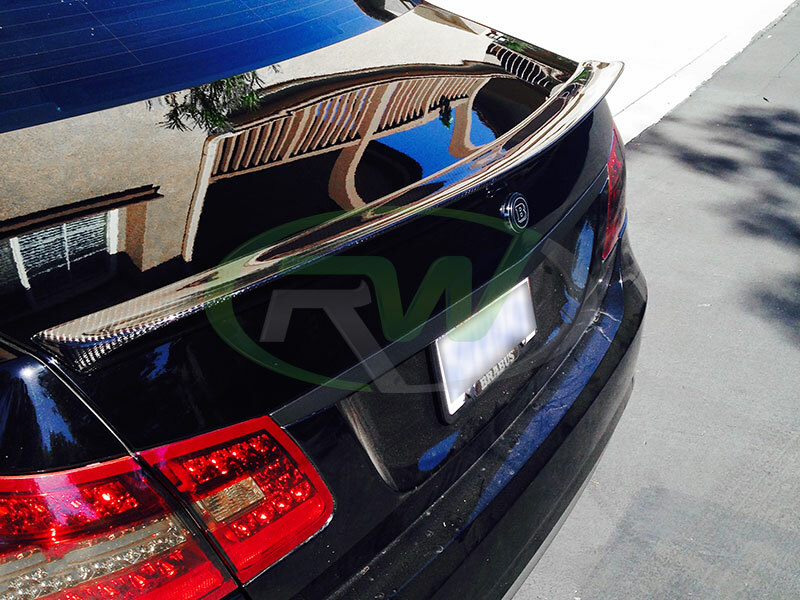 The usual end to a great carbon fiber theme for your 6 series or M6 is a new CF trunk spoiler. 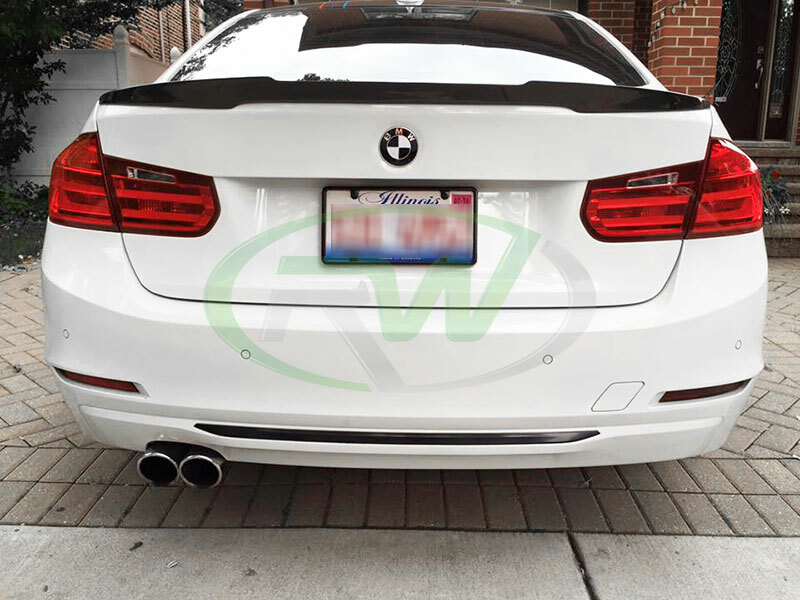 A F06/F13 trunk spoiler not only looks killer on any BMW, but also helps to bring your theme together and adds real, usable down force at high speeds. 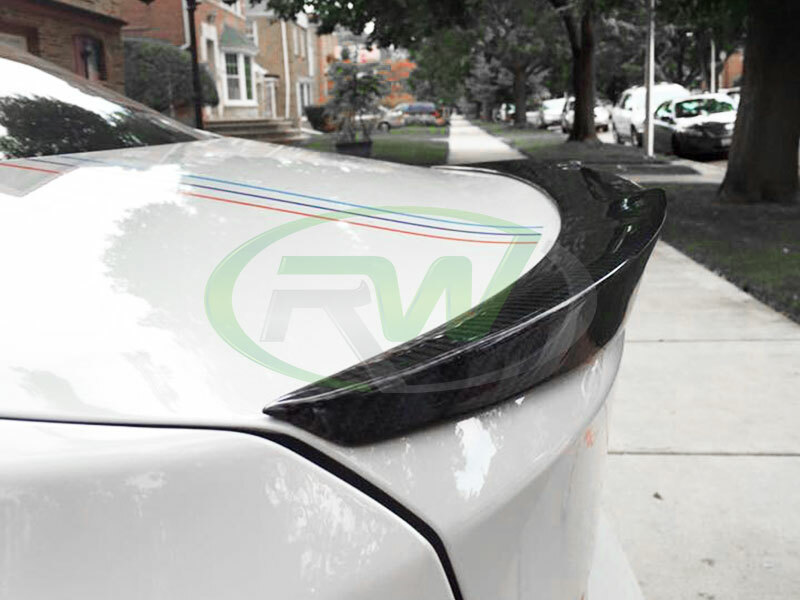 RW Carbon currently offers 2 style trunk spoilers for the F06 gran coupe and F13 coupe models. Unfortunately we do not have a spoiler for the F12 convertible models, yet. 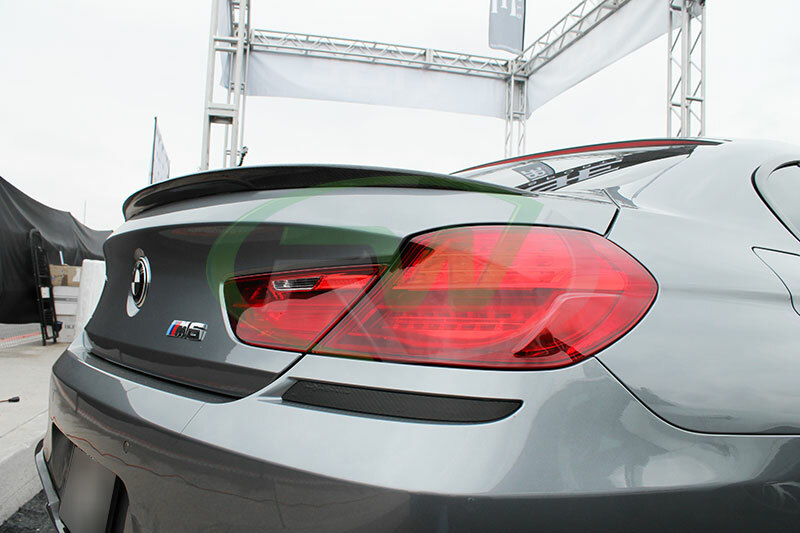 The spoilers the F06 and F13 will fit all models including the 640i, 650i and M6. The first trunk spoiler released was the Performance style CF trunks spoiler. This is a great modest addition to your BMW. It is not too flashy, but definitely satisfies that urge for some CF on your trunk. 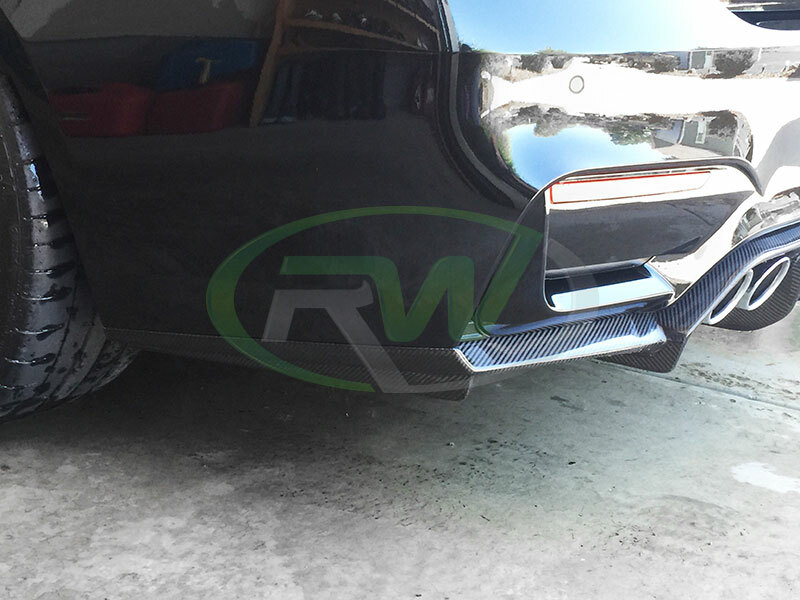 If you want something a little more unique and aggressive, RW Carbon does offer their new 640i, 650i, M6 DTM trunk spoiler. So made of carbon fiber, but is larger and has a more racer looks and feel. 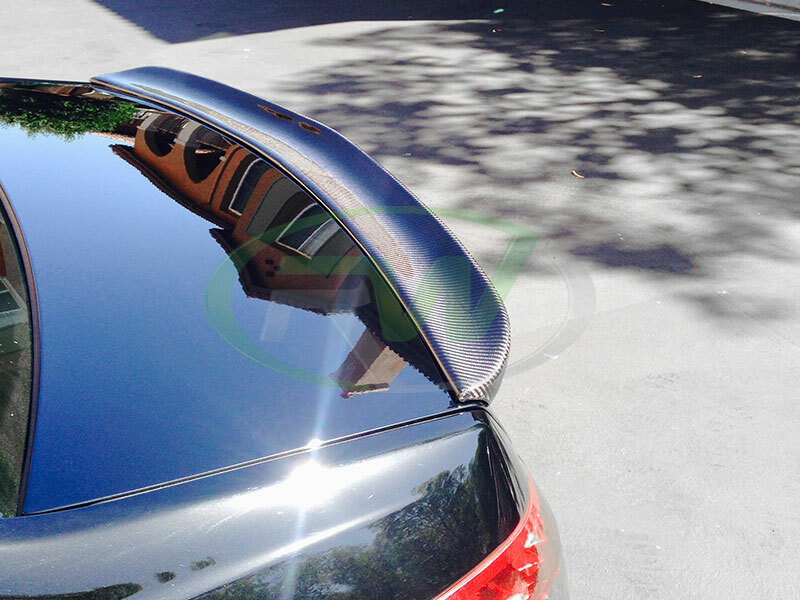 Both trunk spoilers install using 3M double sided tape. We recommend using the 3M Scotch outdoor permanent mounting type. The tape is not actually permanent, (It can be removed with a heat gun and fishing line. 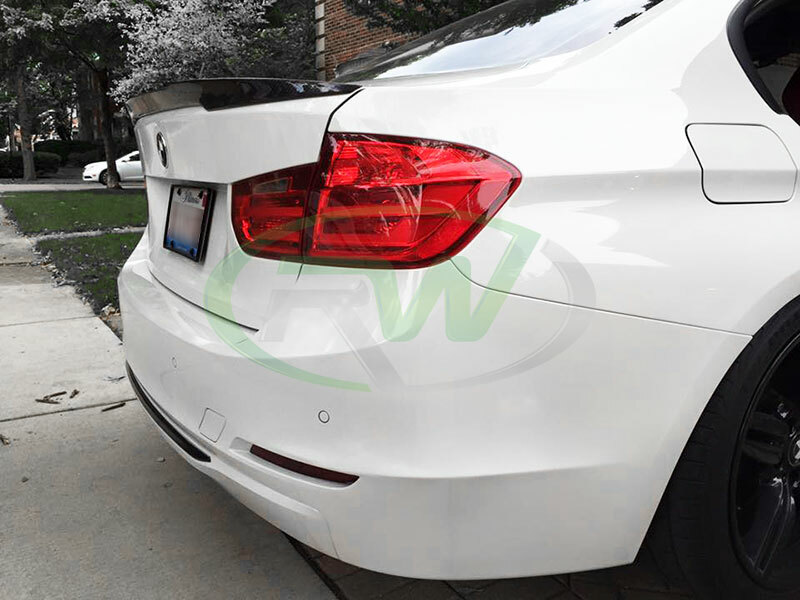 Similar to the OEM spoiler) but gives you the strong hold necessary to adhere the spoiler to the trunk for a long period of time and without falling off at high speeds. These 3 modification are the perfect trio to express your idea of what your 6 series or M6 should look like. 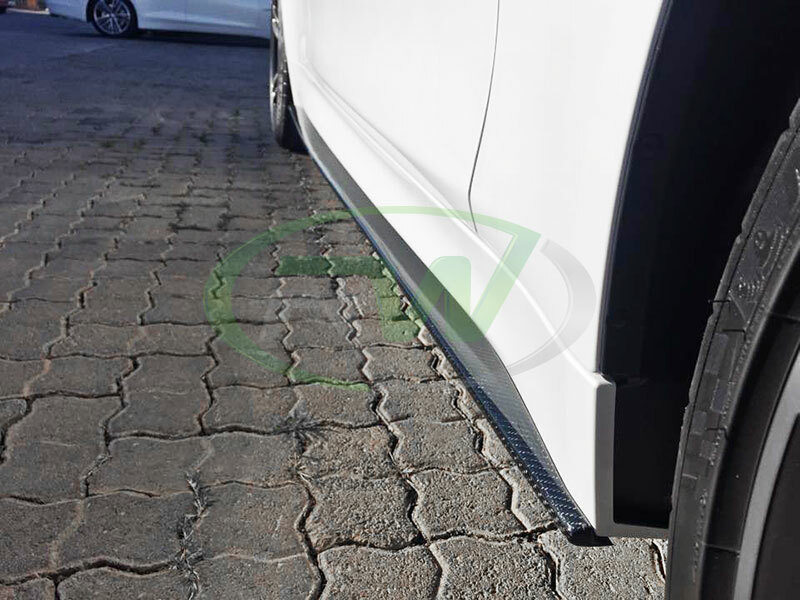 If you want to take it a step further we also offer several interior and exterior carbon fiber accessories and our new F06, F12, F13 CF side skirt extensions. 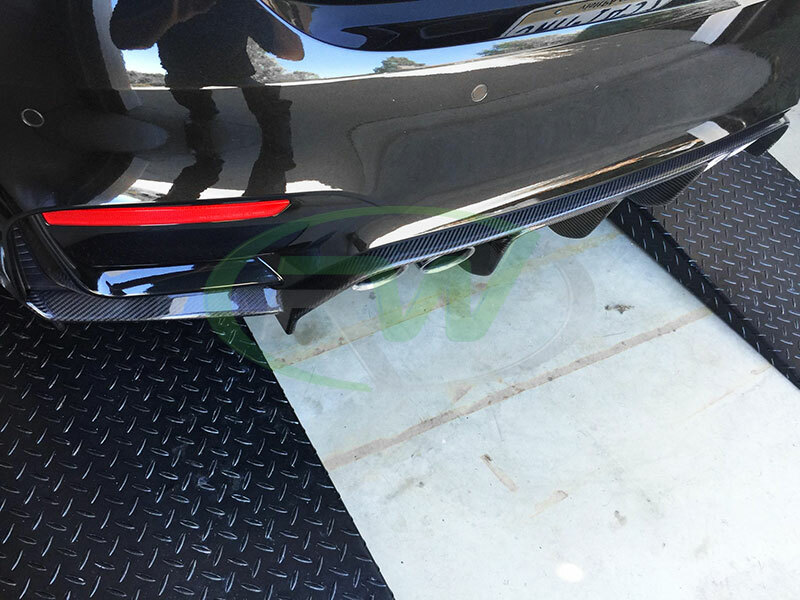 The side skirt extensions are available in either 1×1 or 2×2 carbon fiber weave and attach using 6-8 self taping screws. 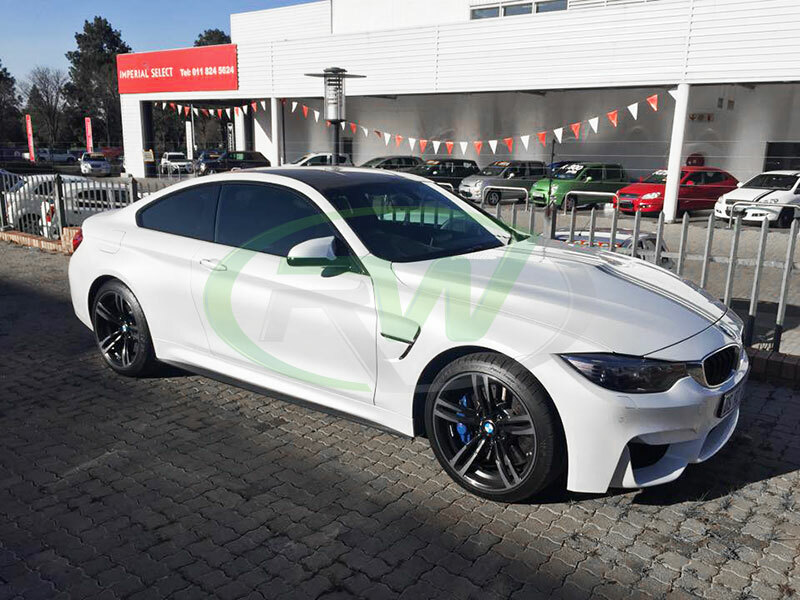 If you have questions related to any of the above carbon fiber aero parts for your BMW F06, F12, or F13 6 series or M6 please feel free to get in contact with our expertly trained staff. We are standing by to answer any questions you may have to help guide you through your build. We can be reached via phone (714) 328-4406 or via email at info@rwcarbon.com. RW Carbon is proud to release our long over due installed pictures of our new carbon fiber DTM trunk spoiler for the Mercedes W212 models. These will fit 2010+ Mercedes E350, E550 and E63 AMG models. If you are after a more aggressive look then the typical AMG styling trunk spoiler, then this is the perfect addition for you. It adds a more aggressive touch while added additional downforce at high speeds. 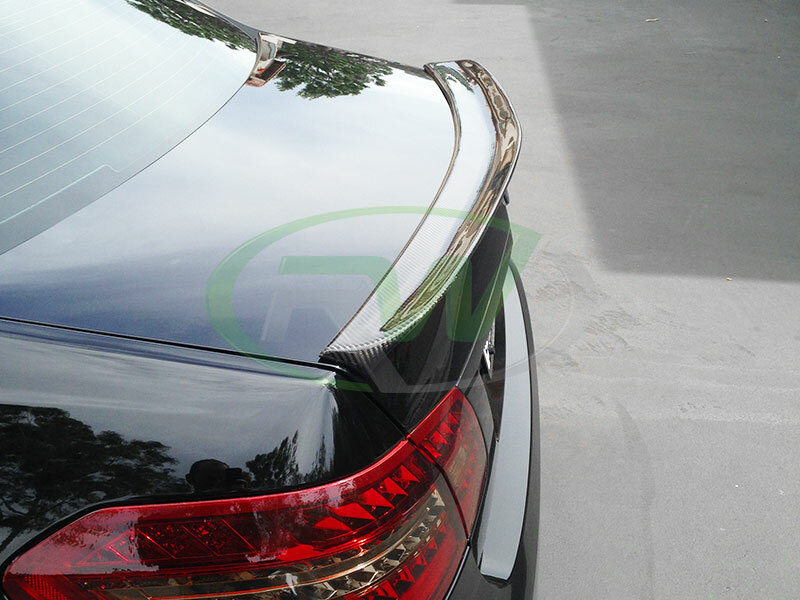 We construct these trunk spoilers out of our signature high quality 2×2 weave carbon fiber fabric and finish it off with a brilliant clear coat that helps to bring out the natural beauty of the carbon weave. Questions? Give us a call at 714.328.4406 or email us at info@rwcarbon.com. If you want to check out more information about this DTM trunk spoiler click here. 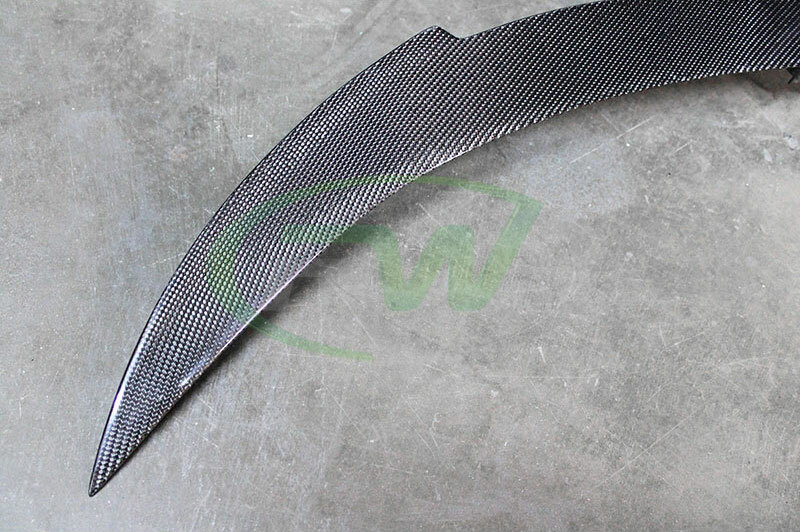 Or visit our online store at www.rwcarbon.com to check out more carbon fiber parts and accessories for your Mercedes W212 E Class. 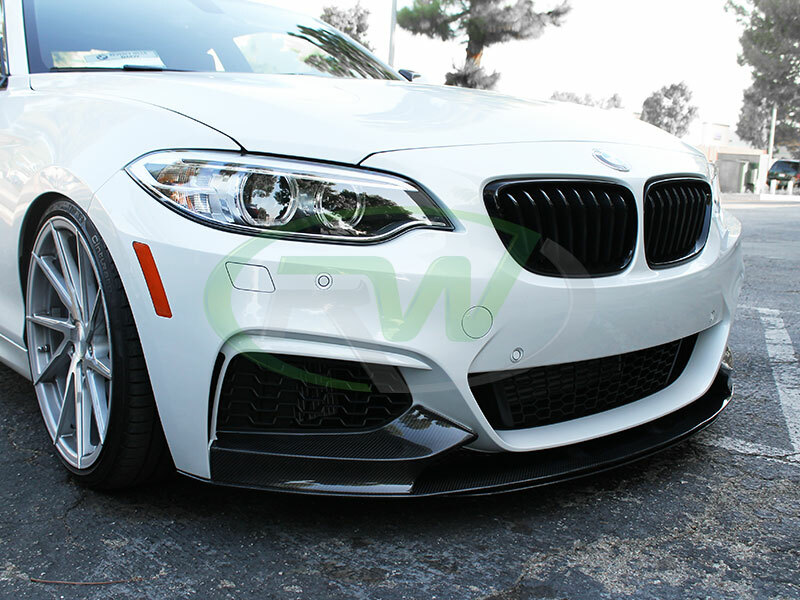 For sometime RW Carbon has only offered 1 style front lip spoiler for the BMW F22 models, the 3D style front lip. With the increasing demand of those lips we decided to release a new one, the performance style. 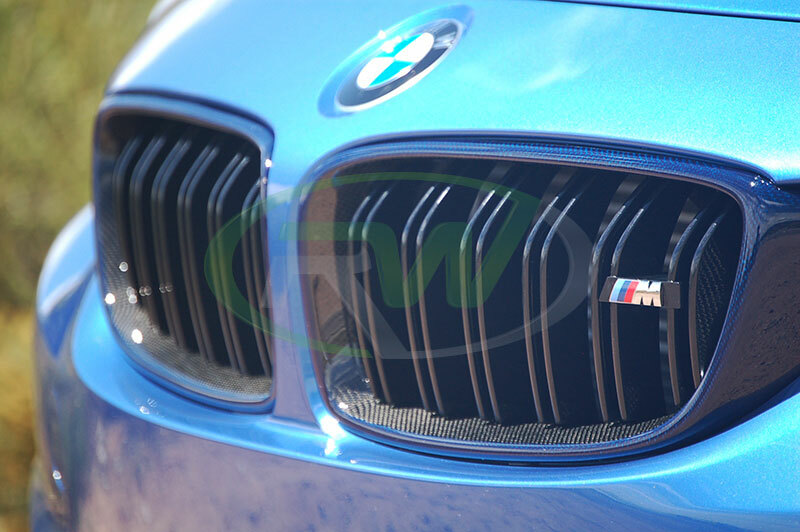 This lip is based on the M Performance front lip made by BMW, but instead of being made from polypropylene (a type of high quality and crack resistant plastic) we manufactured it using real carbon fiber. We decided to make this a 1 piece design for a quick and easy installation process. The only thing required for install is 3M double sided tape for the upper splitter area and about 8 self taping screws for the bottom lip. 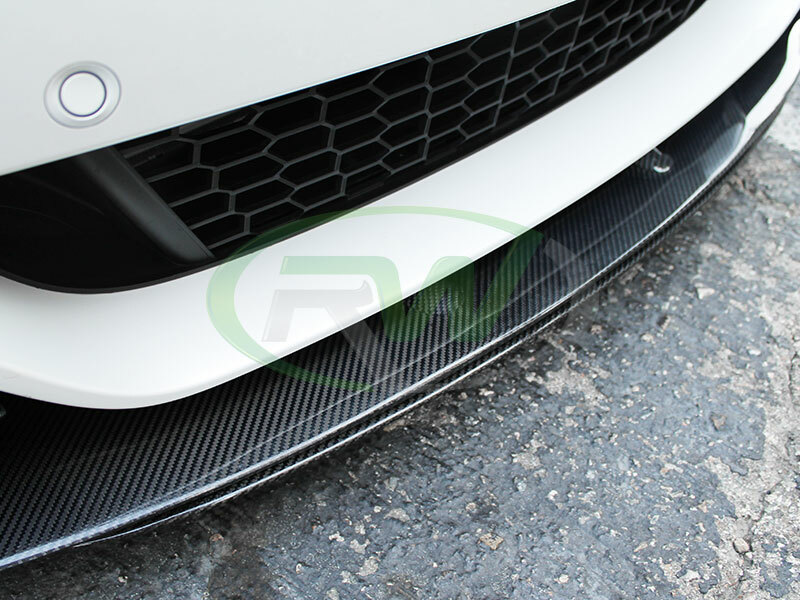 Each lip is made using our high quality 2×2 carbon fiber weave and is clear coated to enhance the carbon fiber look and protect it from prematurely deteriorating. 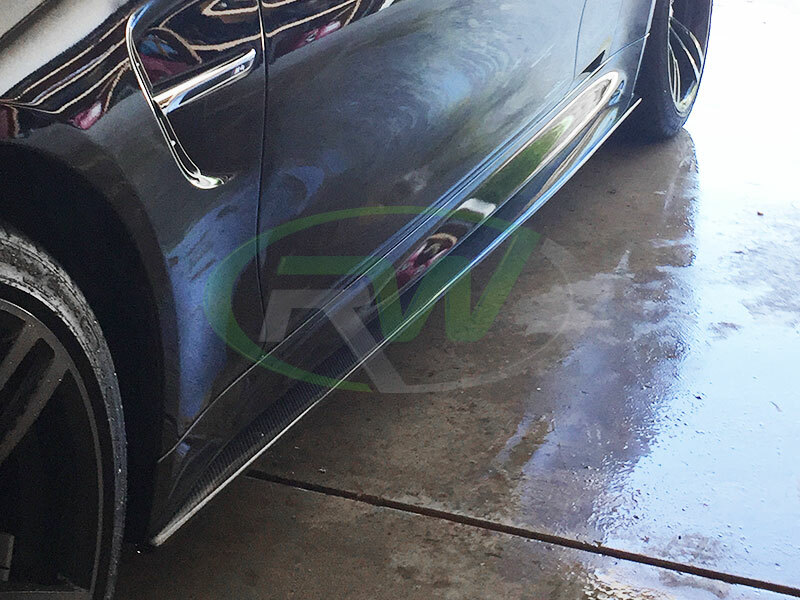 RW Carbon also quality checks each one before leaving out Southern California Facility and offers a fitment and quality guarantee. Yesterday we had the pleasure of getting a brand new BMW F22 M235i here to get our first Performance Style Front Lip installed. Installation was a breeze and the aftermath was breath taking. 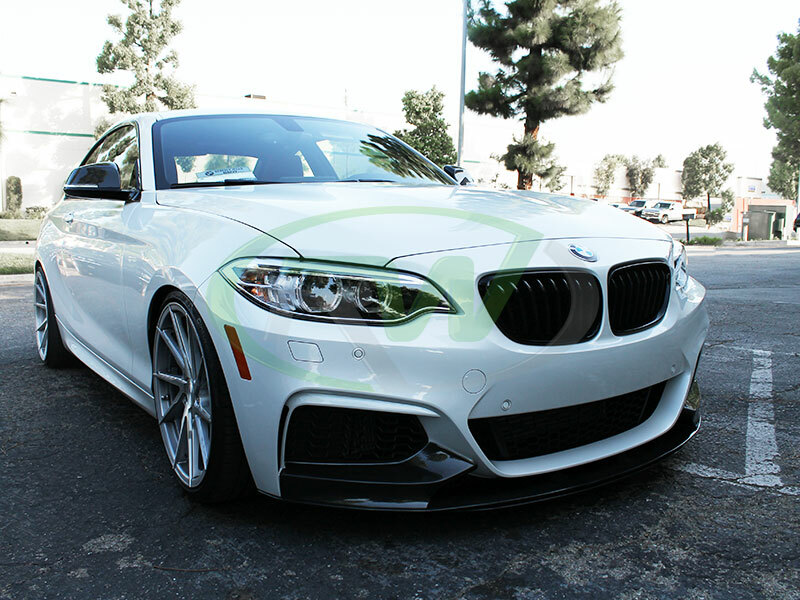 The lip is the perfect addition and adds the aggressive touch so many 2 series owners are after. Other mods on the owners M235i included Stance wheels, lowering springs, M Performance carbon fiber mirror caps and an exhaust system. 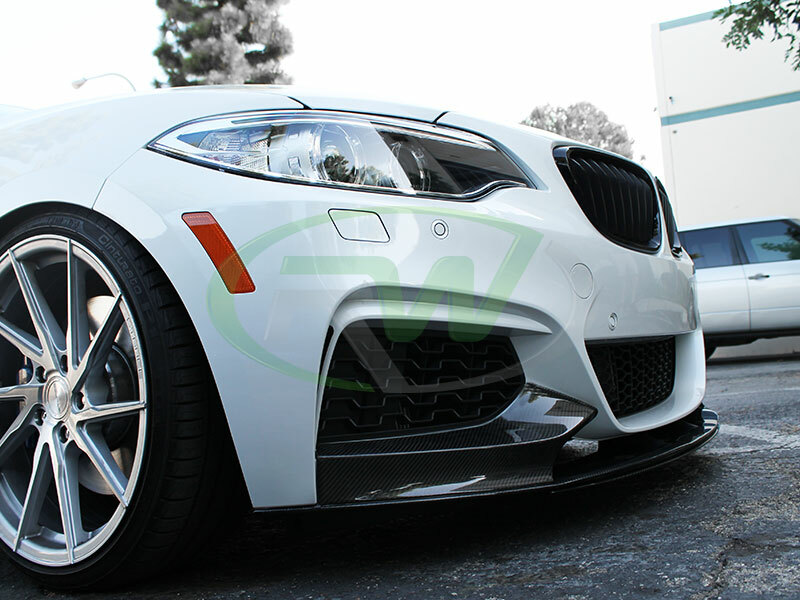 For more information and pictures of our new Performance Style Front Lip for the F22 M Sport models please Click Here. You heard it folks. 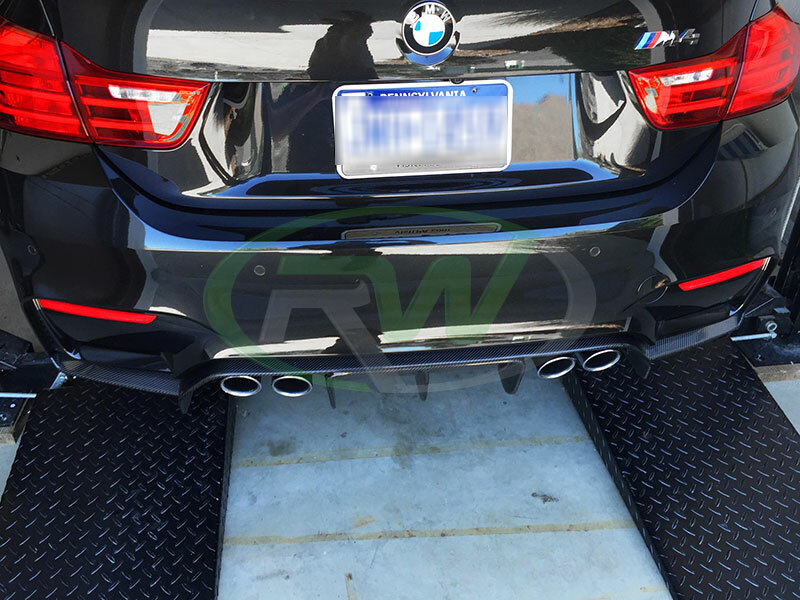 RW Carbon has released their long awaited M4 style carbon fiber trunk spoiler for the F30 (320i, 328i, 335i) and F80 M3 models. 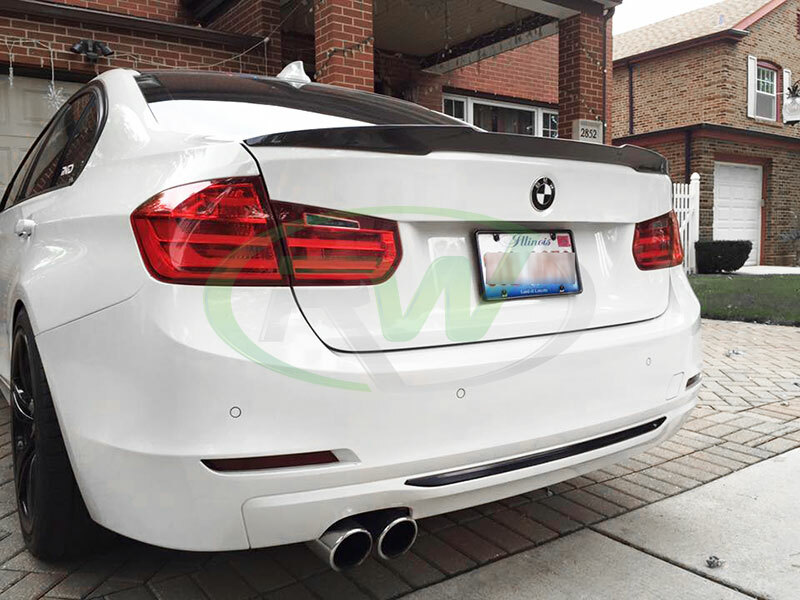 If you are tired of the normal Performance Style trunk spoiler and want something different and more aggressive then this is the perfect spoiler for you. It installs in minutes using 3M double sided tape and instantly gives you that aggressive M4 touch. These are made using the same high quality 2×2 carbon fiber we use for our other trunk spoilers. Each one is hand crafted by professionals for a flawless looking weave pattern and the best possible fitment. Each one is then given a high quality and thick coat of clear to enhance the appearance and protect it from the UV rays of the sun and road debris. 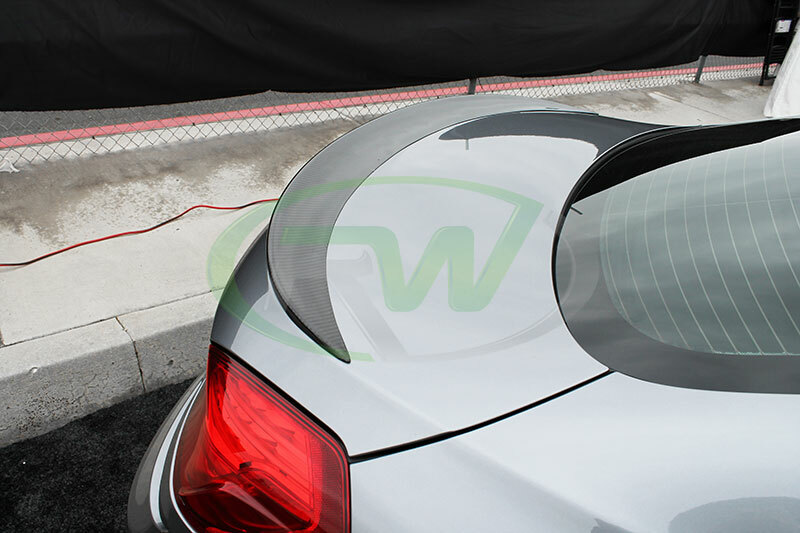 Before shipping to you, we carefully quality check (in our Southern California Facility) each trunk spoiler to ensure you receive a product that is free of defects. 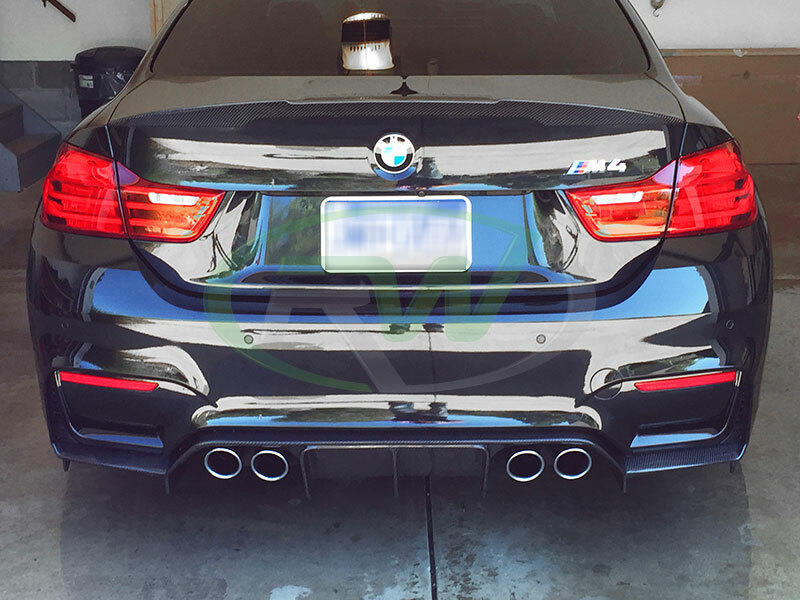 We just received some great customer photos of our new spoiler installed on his BMW F30 328i. If you want to check out more pictures of the trunk spoiler or learn more please check on the link below. If you have any further questions please do not hesitate to contact a carbon fiber specialist. You can reach us at 714.328.4406 or email us at info@rwcarbon.com. The end result is better than I could have imagined. When these diffusers werer finally finished and arrived here I knew they were going to look great, but these pictures really speak for themselves. Fresh out the install bay our good customer snapped a few shots for us and wow what a difference. It really make the rear end stand out and give it that racing inspired feel and look. This customer also when with out carbon fiber side skirt extensions to finish off the CF theme from his M Performance Front Lip Spoiler. Our new DTM carbon fiber diffusers and side skirt extensions are expertly hand crafted with real 2×2 carbon fiber and come with RW Carbon’s fitment and quality guarantee. 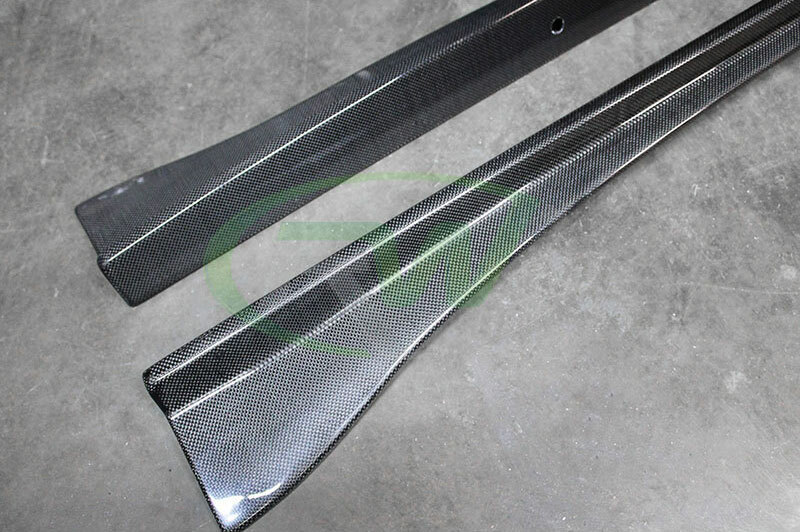 If you want to know more about these items or see more pictures feel free to contact one of our carbon fiber specialists or click on some of the links below. 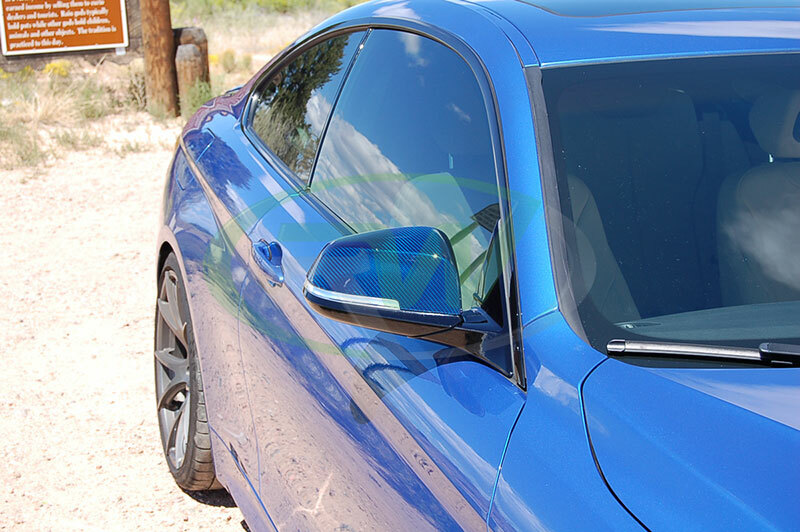 Thank you to one off our customers for sending us some great pictures of his newly installed carbon fiber accessories installed onto his Estoril Blue BMW F32 435i. His first round of parts he went with carbon fiber double slat grilles, fender grilles and mirror caps. 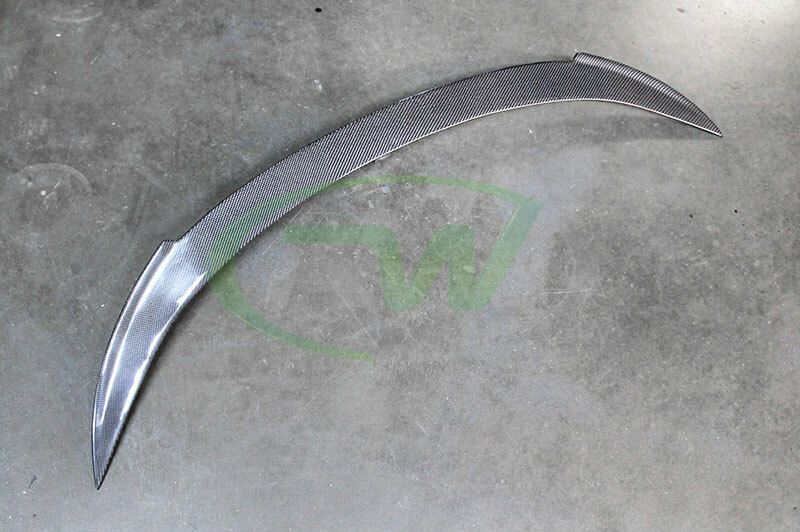 Soon to come is a newly purchased CF steering wheel trim. This customer did something quiet unusual with his CF mirror caps though. He painted the carbon fiber weave to match his car. If you notice on the pictures below the grey sections in the weave are now Estoril Blue. A very cool and unique addition to the caps I must say. Want to check out more information and pictures of the CF accessories get got from RW Carbon? Check out the links below. If you want to learn more or see more pictures click on the link below.